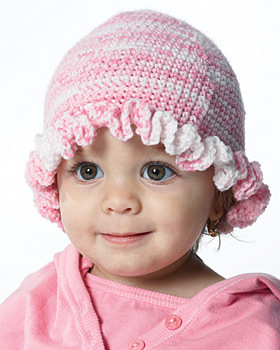 This adorable Baby Ruffle Hat pattern is perfect for newborn baby girls. Made with soft bubblegum pink yarn and embellished with a sweet ruffle, this hat is as much fun to make as it is to give. This cute crocheted hat pattern can be adjusted to fit babies ages 6-12 months and is a simple crochet project that works up quickly and easily. With a few hours to spare, you can have a new adorable crocheted baby hat to fit the new little one in your life. You could also make a handful of these cute hats and donate them to your local hospital or shelter. Gauge: 19 sc and 20 rows = 4" [10 cm]. To fit child sizes 6 (12-18-24) mos. Ch 4. Join with sl st in first ch to form a ring. 1st rnd: Ch 1. 6 sc in ring. Join with sl st in first sc. 2nd rnd: Ch 1. 2 sc in each sc around. Join with sl st in first sc. 12 sc. 3rd rnd: Ch 1. *2 sc in next sc. 1 sc in next sc. Rep from * around. Join with sl st in first sc. 18 sc. 4th rnd: Ch 1. *2 sc in next sc. 1 sc in each of next 2 sc. Rep from * around. Join with sl st in first sc. 24 sc. 5th rnd: Ch 1. *2 sc in next sc. 1 sc in each of next 3 sc. Rep from * around. Join with sl st in first sc. 30 sc. 6th rnd: Ch 1. *2 sc in next sc. 1 sc in each of next 4 sc. Rep from * around. Join with sl st in first sc. 36 sc. 7th rnd: Ch 1. *2 sc in next sc. 1 sc in each of next 5 sc. Rep from * around. Join with sl st in first sc. 42 sc. 8th rnd: Ch 1. 1 sc in each sc around. Join with sl st in first sc. 9th rnd: Ch 1. *2 sc in next sc. 1 sc in each of next 6 sc. Rep from * around. Join with sl st in first sc. 48 sc. 10th rnd: Ch 1. 1 sc in each sc around. Join with sl st in first sc. 11th rnd: Ch 1. *2 sc in next sc. 1 sc in each of next 7 sc. Rep from * around. Join with sl st in first sc. 54 sc. 12th rnd: Ch 1. 1 sc in each sc around. Join with sl st in first sc. Cont in same manner, alternating 12th round with inc round, increasing 6 sts on every other rnd to 72 (78-84-90) sc. Place marker at end of last rnd. Rep 8th rnd until work from marked rnd measures 3 (3 1/2-3 3/4-4)" [7.5 (9-9.5-10) cm]. Ruffle: Next rnd: Ch 4 (counts as dc and ch 1). (1 dc. Ch 1. 1 dc) in same sp as sl st. *(Ch 1. 1 dc) 3 times in next sc. Rep from * around. Ch 1. Join with sl st to 3rd ch of ch 4. Fasten off. If you think this free crochet pattern is adorable, check out our collection of 15 Cute Crochet Patterns for Babies. I don't understand round 12 which round is the increase round? Do I just do a 2 sc then 6 sc then a sc round then do a round with 2 sc and then 12 sc? Do you "turn" the work each time you finish a row.....or do you keep going round and round, without turning? Hi there, For specific pattern inquiries, we suggest contacting the pattern designer (Bernat) directly via their designer profile. You can also post your question on our Facebook page and see if other crocheters have run into the same problem. Thanks! It appears you do not turn the work. Most of the time if you are supposed to turn it, the pattern will say so at the end of the round. If you got different directions from the author, it would be great if you let me know! I would love to know before I try making this pattern. I was able to print this with no problem. If anyone is still having trouble with that, it may be your printer. Try copying the pattern into your word processor and printing from there. Just highlight everything you want to copy, press Control-C, then in Word or whatever you use, press Control-V to paste it. I clicked on the "Print" button provided, and it printed just fine for me. This is a beautiful pattern. I am going to make it for charity and for my neice's daughter who is scheduled to be born in August. Anyone else have probs printing? It prints out the picture and the links (ie: berry, child) but the pattern instructions do not print. I have tried using the print button provided and also my browser print options. Same thing both ways even though it shows the entire pattern in my "print preview" screen. I am making this hat for my granddaughter in the 24 mo. size and am stuck...does it mean you go completely around w/sc until it measures 4" out from the marker or 4" to the side of the marker?...If anyone can explain this part of the instructions I would greatly appreciate it! Thank you! Rep 8th rnd until work from marked rnd measures 3 (3 1/2-3 3/4-4)" [7.5 (9-9.5-10) cm]. How can I make this for a toddler size (age 3-4)? Thanks. Since there was some confusion, we did make some slight changes to the instructions. Hopefully these will make them easier to follow. As was said previously, you repeat rnd 8 for the even round, alternating them with the odd-numbered rounds which are the rounds in which you increase 6 stitches each round. Hopefully, we cleared that up with the changes. For those who can't find row 10. Check pattern carefully. Go to row 8. It says: Crochet for row 8 and alternate rows. It means repeat for row 10. Hope that helps ladies. Have a great day. Marian J. Love this baby ruffle hat! My great granddaughter will look so cute in it! What do I do for row #10? If you have the answer, please e-mail me at golfnutz@gvtc.com Thanks! Thank you. I am so pleased, first, with the pattern, and I always welcome personal remarks. is there suppose to be a row 10?? ?